Welcome to the Luke AFB Thunderbolt Digital Edition! 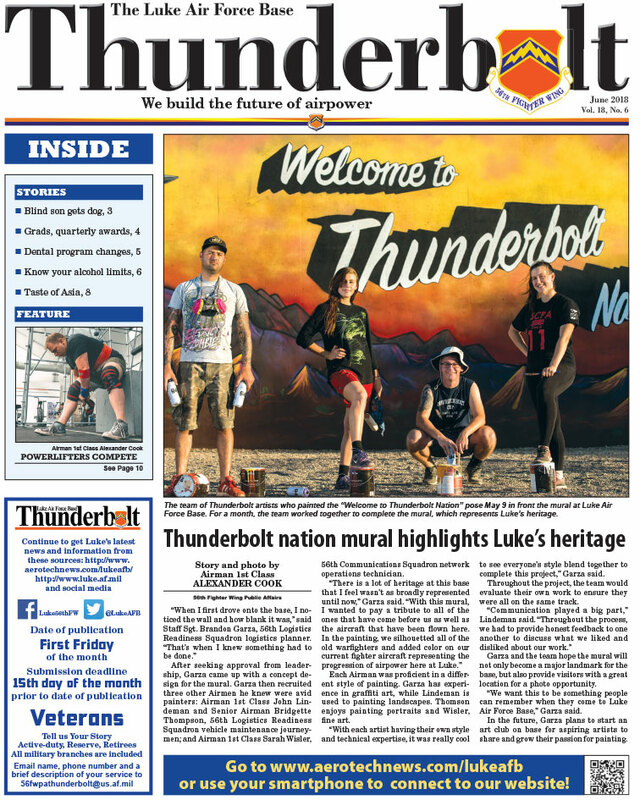 Check out the beautiful mural and the talented group of artists gracing this month’s front page. These gifted Airmen created a beautiful and distinctive piece of art to create a sense of community in Fighter Country. Read about the process in our cover story. In other community news, we introduce you to the Codding family and share how the Exceptional Family Member Program (EFMP) at Luke partnered with them to provide a life-changing resource for their special child – truly an exceptional act of service. On page 4, we have Salutes and Awards – check out the list and see if someone you know has been recognized. And we have a couple of fun photo features for you this month. On page 8, you’ll find a review of the “Taste of Luke” cooking competition (yum!) and on pages 10 and 11, a competition of a different kind, as we showcase Luke AFB Powerlifters in action.